Workers walk toward the Choctaw Nation headquarters building under construction in Durant. OKLAHOMA CITY – When Choctaw Nation Chief Gary Batton was put into office in 2014, his goal was to bring more economic diversity to the Durant-based tribe. He kept the office in the 2015 election. He has overseen the tribe’s expansion of its business ventures with new travel plazas, a Chili’s franchise, additional amenities at its casino resort, and even opening a grocery store. And that’s only a few projects. As of December, the tribe had 40 projects under construction. One of the largest developments is the 500,000- square-foot headquarters building. Construction started in January 2016. 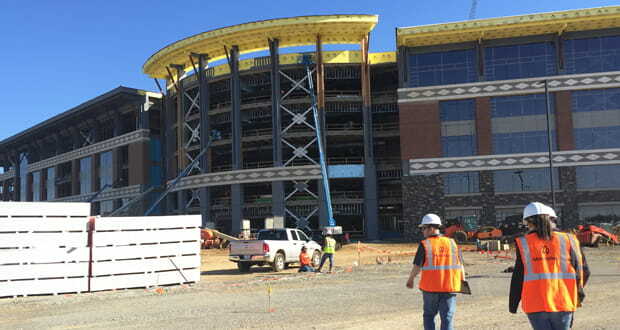 To learn more about the Choctaw Nation Headquarters Building or other FSB Native American projects, contact Market Principal Jason Holuby at native@fsb-ae.com.